Here is our first group of new February mysteries from Penguin authors-The Grim Steeper by Amanda Cooper, A Turn for the Bad by Sheila Connolly, and A Whisker of Trouble by Sofie Ryan. Details at the end of this post on how to win a copy of all 3 books, and a link to purchase them. Sophie Taylor used to have her own restaurant in New York City. When it failed, through no fault of her own, she headed back to the comfort of Nana’s house in Gracious Grove in the Finger Lakes area. Her old boyfriend, Jason, was there, and she could work in Nana’s tea shop. Sophie’s mother had other ideas. She convinced Sophie to try again as sous chef in the Hamptons. The work is hard, the hours long, and any appreciation, nil. When Nana is hospitalized with a suspected heart attack, Sophie is ready to head home. Too bad the chef has no feelings. He says if she goes, she’s out of a job and that would be too bad after her mom bribed the owner to hire her in the first place. Now, not only worried about Nana and furious that her mother has butted into her life once again, she’s back at the tea shop connecting with Jason and all her friends. Nana’s episode was more of a warning than an attack so that’s better than expected. The dean is making a big deal out of it, hinting that Jason took a bribe to raise the grade. There are only a few people who had access to the computer grading system, so finger pointing is rampant as each accuses the other. When the dean turns up dead, with multiple causes possible, the question is more which of the many suspects wanted him dead the most? His wife, her boyfriend, the dean’s girlfriend, Jason, the guilty party in the grade switch—just to name a few. Sophie feels so bad for Jason—and the body was found in Nana’s front yard—that she investigates too. This is the third book in the Teapot Collector Mystery series. Sophie is coming into her own, with a clearer picture of what she wants in life and a lesser desire to please others instead of following her heart. The romance with Jason has potential. Her friends Dana and Cissy are a pair—both sure of what they want but with very different methods of getting it. Thelma Mae, who owns the tea shop next door, is a piece of work. She acts without thinking, is vindictive without reason and has moments of clarity when she does some good. The main thing to remember is everybody has a secret, and they all lie. Sophie shares the recipe for Blueberry Pecan Yogurt tea cake and tips for brewing the perfect cup of tea at the back of the book. Maura’s been in Ireland for seven months now and feels like she doesn’t know much more about the way things are done than she did when she arrived. Even simple things like heating the house are a complete mystery. One thing she’s sure of, when something goes wrong, the people gather round to help, and that means they meet at Sullivan’s, her pub, to work things out. It seems a local farmer, John Tully by name, took his four-year old boy out for a walk along the water. John didn’t come home, and when his brother went to fetch him, only the boy was on the beach. He talked about a big boat, and his dad telling him to wait until he came back. No one can tell how much is truth and how much is imagination. Rumors are flying and include anything from John leaving home to start a new life, to drowning, to a secret life of crime. When the body of a man is found, the worst is thought until an exam proves, it’s not John Tully—but who is it? In the meantime, Gillian, Maura’s artist friend, has shown up off-season. The space she rents as a painter’s studio during the summer is being sold, and she needs to move her things. Maura offers her a room at the house, and Gillian accepts. During the course of catching up, Gillian admits she’s pregnant, but hasn’t told Harry he’s about to be a father. She has some doubts about how he’ll take the news. Although Maura never met John Tully, she feels more and more drawn into his life. And as is usual, those drawing a pint, hear things the local ‘gardai’ won’t. When all the pieces fall into place, who better to put them all together and make a plan than Maura. 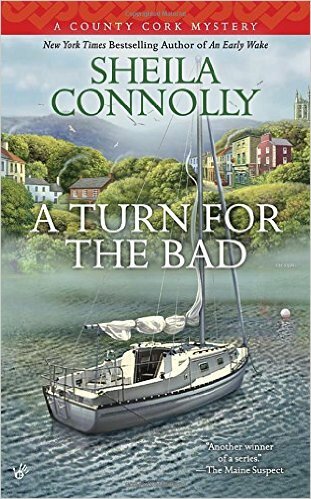 This is the fourth book in the County Cork Mystery series. Each time, readers find out more about Maura as she finds out what she wants and needs out of life. She’s got good friends, a business to run, and a home. The countryside of Ireland is fully a character as well. Maura’s ready to expand her horizons a bit by exploring, so readers will get to go along as she visits nearby towns. Music evenings will add brightness and laughter to the pub. Sullivan’s pub in Leap, County of Cork, is the place to be to find out the latest news, enjoy a warm fire, and a pint of Guinness. It’s a tight knit community, but like Maura, you’ll be welcomed. 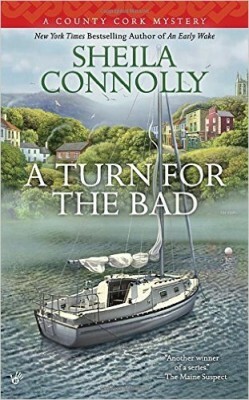 Connolly also writes the Orchard Mystery (8 books) and the Museum Mystery series (6 books). You’ll want to read them all. It’s springtime in North Harbor, Maine and time to find more treasures to restore. Pick up day at the curb usually brings lots of goodies to Second Chance, Sarah Grayson’s upcycling store. It’s a busy place, especially since Mac moved into the space above the shop, the Angels have their detective agency on the sunporch, and a room is being refurbished for classes. The Angels are Liz, Charlotte, Rose, and Mr. P. They’re senior citizens but not ready to be retired from living just yet. They got interested in crime and helped solve a couple of murders. Now they’re hooked, much to the dismay of friends and family. Liam, Sarah’s brother, is in town to visit, so he’s staying at her house. Rose moved in there, too, after she was booted out of the senior living apartments. Mr. P spends a lot of time there, but no one wants to know too much about that! And don’t forget Elvis, the cat. He’s the shop’s charmer for sure. Sarah agreed to clean out Edison Hall’s home after his death. He was a pack rat and had many collections, mostly worthless. His wine collection though, was his son’s inheritance. Too bad it was found to be counterfeit—cheap wine in pricey bottles with forged labels. There are four grandkids and Ellie, their mom, needs back surgery. Money sure would come in handy. On the first day of clean up, Sarah, Rose, Mac, and Elvis arrive at the house, only to find a dead body in the kitchen. It’s Ronan Quinn, the man hired to value the wine collection and who was determined to find out who the counterfeiters are. Nick, as medical examiner, is on hand and heartily disapproving of any involvement from the Angels. Still, Stella is their friend and Edison’s sister, so it’s possible they’ll want to help. No matter who tells them to stay out of it, the Angels just nod, smile, pat a hand or arm, and go on with what they were doing. It’s easier to help them and keep an eye on them, than to turn them loose. Mr. P is great at finding things on the computer, although maybe not everyone should know just how he does it. Rose is his sidekick, and you never know where her mind is going next. The others pitch in as needed. It’s a tangled tale to figure out who are the good guys and who are the bad guys and how to keep everyone safe. Sarah is a treasure with patience galore. Mac and Nick—both would be good romance interests for her, but why ruin a friendship over a possibility? Elvis—well, he knows a lot more than he’s telling, although he’s not shy about what he does share. 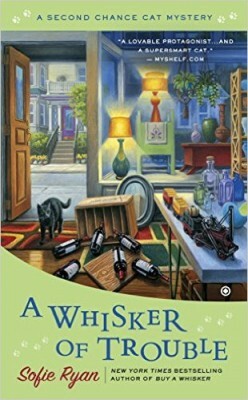 This is book three in the Second Chance Cat series. I can’t wait for book four—not after the way this one ended! Is that enough of a teaser? There were surprises and twists and turns to follow to a satisfying ending—and it just leaves readers wanting more. To enter to win a copy of all 3 books, simply email KRL at krlcontests@gmail[dot]com by replacing the [dot] with a period, and with the subject line “February,” or comment on this article. A winner will be chosen February 13, 2016. U.S. residents only. If entering via email please include your mailing address, and if via comment please include your email address. 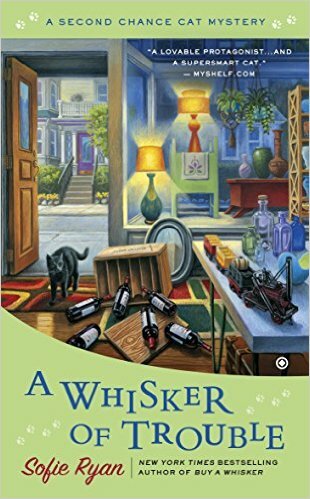 Looking forward to these new mysteries! Hard to know where to start with so many good titles. Thanks for the chance to win! These all look like amazing reads. I like every one of the authors. Thanks for a great giveaway. I have entered by email, but am commenting in support of the book synopsis/review. All three books are near the top of my “must read” list. 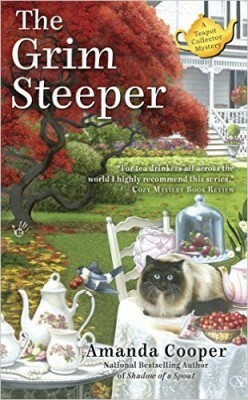 I am passionate for all things ‘tea,’ so The Grim Steeper by Amanda Cooper is a must; Sheila Connolly’s A Turn for the Bad will fulfill my interest in all things ‘Irish’; and A Whisker of Trouble by Sofie Ryan is new to me and including a quartet of senior citizens in the story is fun! Great reviews. I read two of these series and have the other on my TBR list. Thanks for the chance to win. These books sound amazing, and I adore the cover art. I am looking forward to reading them. Thank you for the giveaway. The cover often “sells” me a book and these are right there near the top!!! Really good reviews, y’all always have reviews which make me want every book reviewed. Thanks. I’d be ecstatic if I won these three great books. I am a fan of all 3 authors. Three great authors with what I’m sure are three great new books. Looking forward to reading all of them.Thanks for the chance to win. They all look like great reads. Will have to add them to my “to read” list. Thanks for the chance to win them.